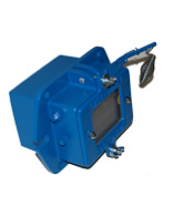 The Saf-T-Eye® Observation Ports allows the operator to safely and clearly inspect the interior. The Blast Gate Observation Ports use the standard line of Tate-Jones blast gates as the primary component and incorporates a glass lens, gaskets and rings securely retained with metal bushings. 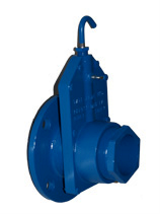 Tate-Jones Blast Gate Valves are used to regulate air flow and provide shut-off. They give 100% full flow and operate with clean or dirty air. These valves are for use in low pressure applications where 100% shutoff is not required. The Tate-Jones Round Observation Port provides a safe and clear method to view the interior of a vessel. The port mounts easily to the vessel wall to protect from dust and sparks. The Tate-Jones Hi-Temp Peep Sights have standard NPT male pipe threads. 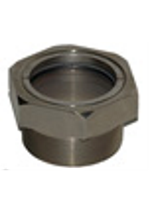 The housing of the units is available in stainless steel or carbon steel with nickel plating. The lens can easily be removed for cleaning or replacement. Standard stocked units range in size from 1/2" to 2". Custom based units up to 6". Call us with your glass cutting and fabrication needs! 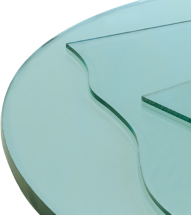 We can custom cut glass to meet your specifications. Our equipment can provide a variety of edge finishes. We specialize in high heat glass products such as Quartz and Vycor. 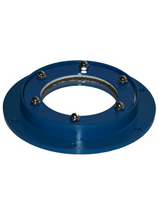 We manufacture flanges precisely within our customers tight tolerances. Bring your flange designs to us and we'll fabricate them in the most cost-effective production method possible. Abrasive waterjet cuts shapes and patterns from virtually any type of material using high pressure water and abrasive materials such as crushed garnet. As part of our Prototype Design service we can precision machine your product. Call us about your project or request a quote.